This was another one of those books that I've been looking for, for a while. Surprise, surprise. I've heard a lot about it and was kinda weary when I began reading it and boy did it live up to my expectations. Megan Chase is just your average girl who feels just a little out of place. With Her best friend Robbie, a fairy in disguise, right by her side. 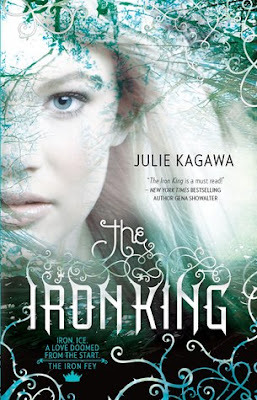 What she doesn't know is that her father is actually the fairy king Oberon and to save her missing brother she must visit the Fairy World and find the Iron King. Although things don't go as smoothly as planned. She risks death, loss, and even falling in love. The entire plot was awesome and the characters were so likable. Not to mention the whole Robbie vs Ash thing going on. That was hilarious. x3 Is there anything better than two hot guys fighting over you? The world of fairy's was just as awesomely created. Everything was really oddly placed and surreal when you read it that you couldn't help but want to go there. To put it lay man's terms, it was awesome. Cover/Title: It's really pretty and the colors are really eye catching. It's just one of those things that can carry a series.